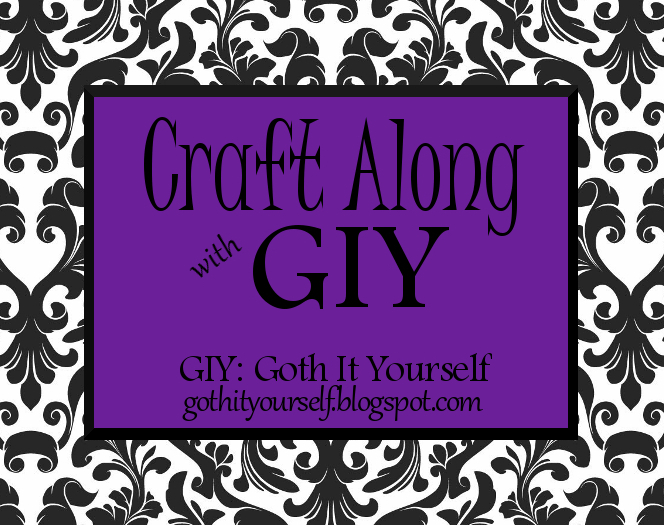 The theme for this month's Craft Along with GIY is Rhymes with "That". For my project, I painted and stenciled my standing mirror with gloss over matte. The mirror came from a thrift store and was plain brown. I primed it and painted it matte black. Then I stenciled it with gloss black. It looks prettier now, and it matches my stenciled dresser and chest of drawers. 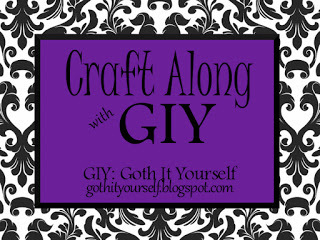 On March 31, I will compile the links on the Craft Along with GIY page. I needed some electrical work done in my basement (more on that later), and decided to have the electrician replace some light fixtures while he was here. The fixtures in the hall, entryway, and stairwell were essentially ugly white blobs. For the hall and entryway, I chose to use the same fixture that had taken the place of my gold UFO-like ceiling fan in the dining room. 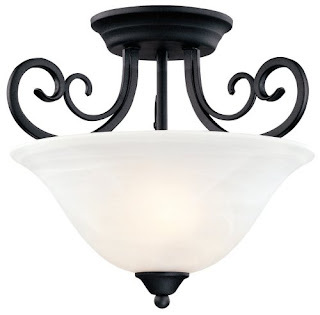 It's black, resembling wrought iron, with a swirled white glass shade. For the stairwell, I chose the matching sconce. 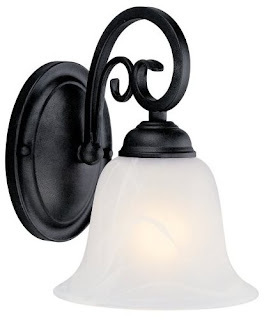 The new fixtures don't create a dramatic transformation, but they certainly do look prettier than the old white blobs. They also provide much more light as they hold two bulbs instead of one. The sconce in the stairwell isn't very visible, which is too bad because it's pretty. 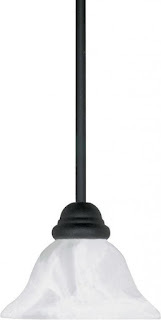 And it's a legit wall fixture, unlike the white blob fixture which was never meant to be mounted horizontally. It was mostly luck keeping the glass from falling off. While those fixtures are very nice, what I'm really excited about are the three new pendant fixtures in my dining room. The two-bulb ceiling light was the only lighting fixture in my dining room/living room, leaving the area rather dim. To get enough light at the dining table where I craft and sew, I hung three IKEA "light bulb on a string" type lamps. They solved the lighting problem perfectly, but I didn't love the cords strung across the ceiling and down the wall. And the only switch-controlled outlet was on the other side of the living room, requiring a 40-foot (about 12-meter) extension cord run along the bottom of the walls. Now, I have upgraded to hardwired fixtures. :D The electrician installed three hardwired pendant lights which are controlled by a switch in the dining room. Time for a new craft-along! During March, I will work on a craft project for the monthly theme. Around March 29, I will post my completed project. You can share a link to your completed project on that post or at any time during the month on this post. 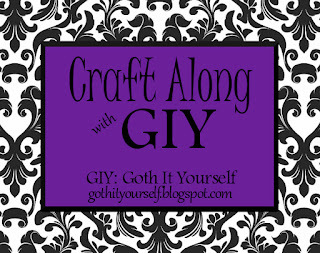 On March 31, I will compile the links on the Craft Along with GIY page. I will be sewing a placemat.